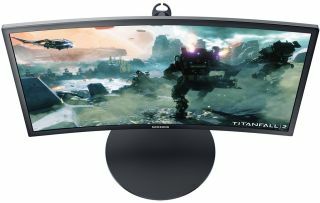 Samsung announced three new curved gaming monitors that employ the same quantum dot technology found in its TV lineup. They include the CFG70 available in 24-inch and 27-inch models, and the CF791 available in a larger 34-inch model. Quantum dots are nano-sized particles that display different colored light based on their diameter. Displays using quantum dot technology are hyped to rival the quality of OLED panels, though current generation quantum dot solutions still rely on an LED backlight. Even so, Samsung claims both new monitor series offer up vivid and crisp colors while requiring less energy. "Both monitors express brilliant color across a 125 percent sRGB spectrum, giving greater depth to blacks and sharpening color intricacies. These color distinctions increase the nuances of game play and far surpass display offerings available in conventional monitors," Samsung says. Samsung plays up the immersion factor due to the curvature of both monitor series, which for the CF791 is rated at 1,500R and for the CFG70 is rated at 1,800R. The two CFG70 monitors both offer a 1920x1080 resolution with a 144Hz refresh rate and 1ms response time. They also have height adjustable stands that support tilt, swivel, and pivot. Why anyone would want to pivot a curved display into portrait mode is a different matter. Samsung's CF791 boasts a 3440x1440 resolution with a 100Hz refresh rate and 4ms response time. Its stand is height and tilt adjustable, but doesn't support swivel or pivot. All three models have a single DisplayPort and two HDMI ports, as well as a headphone jack. Only the CF791 has built-in speakers (a pair of 7W cans) and a two-port USB hub. All three displays also support variable refresh rates via FreeSync. Pricing for the CFG70 is $399 for the 24-inch model and $499 for the 27-inch SKU, while the CF791 costs $999. All three will be available in the fourth quarter.